【FISHEYE LENS】: It can greatly expand the shooting range, 180 degree field of view, and present a kind of condensed scene, which is a very artistic effect..
【WIDE-ANGLE LENS】: Expand the mobile phone photo scene, the photos are almost no distortion, and you can shoot a large scene in a small range..
【MACRO LENS】: It is initially assembled with a wide-angle lens - it can be used for close-up photography of 12 mm. When using a macro lens, you need to unscrew the wide-angle lens,then you will use the macro lens..
【10X TELEPHOTO LENS】:The 10x telephoto lens allows for a pretty nice close-up of an object You can use it very well for watching concert and games..
【PORTABLE FOR CARRY】:The phone lens kits portable and convenient for carrying in pocket.Ideal for camping, fishing, hiking, golf, scope, sporting events, concerts, bird watching and travelling..
Specification: Name: 4 in 1 universal clamp camera lens kits Color: Black Fisheye: diameter 0.98inch high 0.59inch weight 12.5g Wide angle: diameter 0.83inch high 0.39inch weight 5.5g Macro: diameter 0.43inch high 0.32inch weight 2.6g 10 times: diameter 2.76inch height 1.1inch weight 64.2g Cat clip: diameter 2.68inch high 1.38inch weight: 21.3g Material: Advanced imported optical glass lens Metal case - high quality aluminum Lens glass: multi-coated optical glass Mirror cover: high-strength engineering plastic Features: ● Appearance: It is made of aluminum alloy case, which is lighter and brighter. ● Process: The blue film plating of the lens increases the transparency of the lens. ● Practical: The new clip connection makes it easier for customers to load and unload. ● Installation: The lens connection does not require 100% alignment to the center and does not affect imaging. ● Applicable: 95% of mobile phones with camera function are available on the market. Warm Tips: ▲Better take off the case before using ▲Please wipe clean telephoto lens first ▲Make sure the cell phone camera lens center overlap & parallel with smart phone camera. ▲If there is vignetting appears on the phone, please re-adjust the clip ▲The wide angle lens and macro lens are screwed together. (NOT LENS MISSING). Package lists 1* cat clip 1* fisheye lens 1*wide angle + macro lens 1*10x telescope lens 1*cloth bag How to use the telescope lens Attach the clip to your phone and align it with the phone camera. Rotate the screw on the clip to make it tightened. Hold the clip and screw the lens on the clip. Rotate the ocular lens ring to eliminate shadows around the picture. Rotate the objective lens ring to focus. 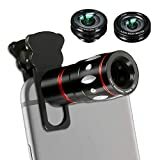 ☆ 6 IN 1 PHONE CAMERA LENSES KIT - Including 18X Mobile Telephone Zoom Lens, 2X Telephoto Lens, 198°Fisheye Lens, 0.63X Super Wide-Angle Lens & 15X Macro Lens (screwed together), CPL Filter Lens, Storage Case, Tripod Mode, Lens Clip x 2. 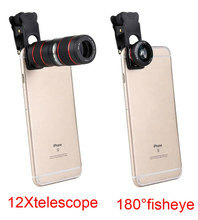 ☆ 18X TELEPHOTO ZOOM LENS - Turn into a telescope. Rotate the focus ring to easily adjust the focal length of the lens to make these long-distance scenes a clear image. 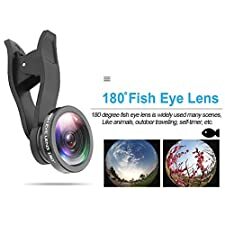 Dedicated for long distance photography..
☆ FISHEYE LENS, WIDE ANGLE & MACRO LENS - 198 ° Fisheye lens creates a circular funny picture, Wide-angle lenses can take a larger range, such as party photos and city landscapes, Macro Lens can zoom in at a close distance and capture the beauty of detail,. 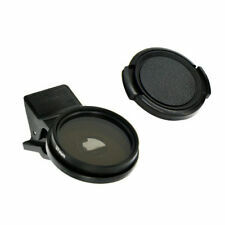 ☆TELECONVERTER LENS & CPL, COMPATIBLE DEVICES: Lens - The teleconverter can zoom in on the subject, making the scene clearer. CPL lens increases the color density, and the reflected light is removed to make the scene color more natural and uniform. 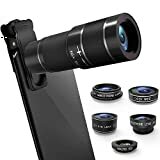 Perfect smart phone lens kit for iPhone X, iPhone 8 8 Plus iPhone 7 7 Plus, iPhone 6S, 6S Plus, iPhone 6, 6 Plus, iPhone 5S, SE, Samsung Galaxy S6, S6 Edge, S7, S7 Edge, HTC, Sony, LG G6, G5 and many others. ☆ APPLICABLE TRENDS AND WARRANTY POLICIES: Suitable for hiking, picnics, parties, media social, Christmas gifts, birthdays, etc. Our Worry-Free 12 Month Warranty plus our lifetime customer service makes your purchase absolutely risk-free..
Three Great Lenses for Awesome Mobile Photography Please note: The macro and wide angle lenses are screwed togetherUnleash your creativity and take amazing mobile photos with this practical and effective lens kit. The universal design of the kit allows you to use it easily with a multitude of different portable devices. Contents:1 x Fish Eye Lens Works like an ultra-wide angle lens. With it, your phone lens will capture rounded images instead of square ones. 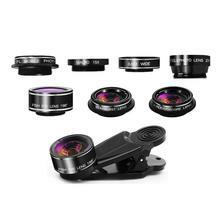 1 x 2 in 1 Macro Lens and Wide Angle Lens Two lenses combined for easy storage and transport. The wide angle will allow you to conquer what was once too large a scene to capture, stretch the limits of your lens to capture cityscapes, large group shots and more. The macro will enable you to get super close to object to pick up all those small details you usually miss. 1 x Universal Clip-On Lens Holder Screw the lens of your choice into the clip and simply place it over your device's camera. 1 x Microfiber carrying pouch Compatible with:Smart Phones and Tablets including: iPhone (X, 8, 7, SE, 6, 6+, 5, 5S,5C, 4, 3; Samsung Galaxy ,S7, S7 edge, S6, S6 edge, S5, S4, S3 Note 5, 4, 3, 2; iPad 2, 3, 4, Air; and more CamKix®If for any reason you are unhappy with any product by CamKix , please do not hesitate to contact us. We take full ownership and responsibility for the quality of our products and will do our very best to solve your problem quickly and efficiently! Wide angle and macro lenses in a 2 in 1 set: These two small lenses are screwed together for easy storage. 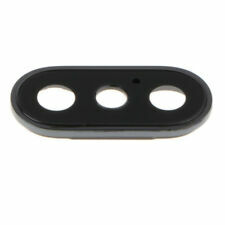 To use the wide angle, simply attach both lenses to the case provided. To use the macro lens, simply unscrew the wide angle lens.Three great lenses in one kit: The fisheye, macro and wide angle lenses give you an array of shooting options to help you enhance your mobile photography.Universal lens clip: The lens included in this set can be used with a wide range of cell phones and mobile devices including iPhone 6, 6+, 5, 5C, 5S, 4, 3; Samsung Galaxy S5, S4, S3; iPad 2, 3, 4, Air; and many moreHigh quality aluminum construction: The lenses are made from aluminum to increase the durability of the product.Velvet carrying bag included: Keep lenses clean and safe - store them in the velvet bag provided.